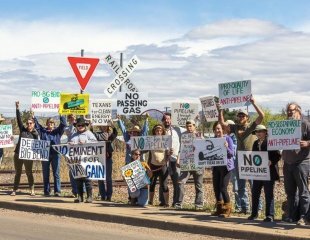 Not Just North Dakota: Here Are 10 More States Where Activists Are Fighting Pipeline Projects | "Global Possibilities"
Brave citizens are fighting hard to stop a number of big projects. With the Dakota Access Pipeline nearly 90% complete, developers are focusing their attention elsewhere. Meanwhile, protests against additional pipelines throughout the country have yet to receive a tenth of the airtime. Beyond North Dakota, here are 10 states that have also been battling pipeline projects. Construction of the 255-mile Nexus Gas Transmission project, a partnership between Houston-based Spectra Energy and Detroit’s DTE Energy, is expected to begin by early 2017. The Dakota Access Pipeline project faced resistance in Iowa long before it reached Standing Rock. In July 2015, landowners in its path urged the Iowa Utilities Board to reject permits needed for the project to proceed. “Our century-plus-old farm was taken care of for four generations and I will do my best to keep it that way,” they wrote in their objection. But the anti-pipeline group Bold Iowa has pledged to keep fighting the four-state, 1,172-mile crude oil pipeline until it becomes operational. The group’s direct action includes standing in court with Iowa landowners in the path of the Dakota Access Pipeline battling eminent domain abuse. Standing Rock’s success this December reinvigorated a more than two-year battle to half construction of the Trans-Pecos pipeline, a 148-mile joint venture with Mexico’s federal electricity commission, the Comisión Federal de Electricidad. The company behind the Dakota Access Pipeline is currently planning a 162-mile pipeline that would cut through the Atchafalaya Basin and 11 Louisiana parishes. But resistance to the Bayou Bridge Pipeline has already spread worldwide. Concerned citizens and environmental groups from New Zealand to South Africa have gathered thousands of signatures, leading the U.S. Army Corps of Engineers to call for a public hearing in which the water quality permits of the site will be assessed. The Sierra Club, Chattahoochee Riverkeeper and Flint Riverkeepers filed a motion in late October to expedite review of the Southeast Market Pipelines Project, which includes the $3.2 billion Sabal Trail gas pipeline. Protests have continued for the past month and 16 demonstrators have been arrested thus far. On November 15, outside the Army Corps of Engineers building, Huntsville protesters gathered in solidarity with the thousands at Standing Rock. The Sabal Trail pipeline is set to cross three states and cover 500-plus miles (86 in Alabama, 162 in Georgia, 268 in Florida). Diamond Pipeline is a planned 440-mile oil pipeline by Plains All American Pipeline and Valero Energy Corp across 14 counties and five rivers in Arkansas. The project is set to begin by the end of 2016. A nearly 600-mile proposed pipeline drew protests in three cities on November 19. In Pembroke, Fayetteville and Nashville, hundreds marched in opposition to the Atlantic Coast Pipeline which awaits a review by the Federal Energy Regulatory Commission. Dominion Power and Duke Energy’s $5 billion project would carry natural gas to North Carolina from fracking operations in West Virginia, Ohio and Pennsylvania. Sunoco Logistics pushed back the timeline for its Mariner East 2 natural gas liquids pipeline on November 12. The $2.5 billion project has not yet received the necessary approvals, even months after charging Huntingdon County residents who objected to the pipeline being built on their property. The National Fuel Gas Supply Corp. awaits approval from the Federal Energy Regulatory Commission to begin its proposed $410 million Northern Access Project in Western New York. Meanwhile, 50 miles outside of NYC, Spectra Energy’s pipeline expansion project continues to face controversy.